GEORGETOWN RUNNING CLUB: Go Mom! As many of you know, my mom is the reason I got into this sport. She's been running (and frequently winning...at least in her age group) road races for as long as I can remember. 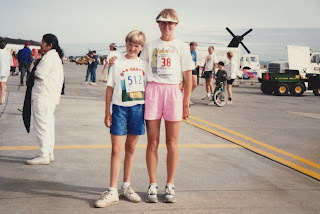 I think this picture was taken the last time my mom and I ran the same race, but different distances. It was taken ca. 1992. She ran the 10K; I ran the 5K. So when you head out to cheer on Saturday morning, look for Holly Turner. She looks just like me (we've been mistaken for twins, much to her delight), so I doubt she'll be hard to recognize. But just in case, she's Bib 2220. Let's just say, I TOO want to be running marathons when my oldest child is a year off 30.... She's pretty amazing. Adorable picture! You'll have to stage a 2009 remake, complete with visor and what looks to be umbros:-). Good luck to you both!